DETERGENT & SOFTENER: HOW TO USE THEM? Detergent and softener are like water and oil – they do not mix. The chemical reaction between the two would render one of them useless. Learn the right way to use detergent and softener for the best cleaning result! Put your laundry into the machine without exceeding the inner tub-level. Put the appropriate amount of detergent in the dispenser as recommended. Push “Start”. The water will flow into dispenser, discharging the detergent into the tub. 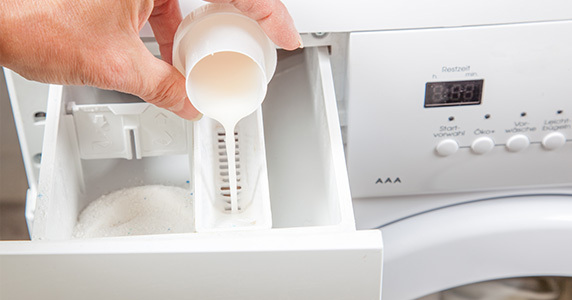 Put the appropriate amount of softener into the softener dispenser without exceeding the maximum fill line. During the last rinsing cycle, water will automatically flow into the dispenser, discharging the softener into the tub. Pre-dissolve the detergent with water before adding into the washer. Alternatively, you can fill the washer with water before adding the detergent. Make sure the detergent is properly dissolved. When the machine is half way filled, add in the garments and start the cycle. Add the softener manually at the beginning of final rinse cycle. Be careful not to pour it directly onto the clothing. The best way to avoid this is to dilute the fabric softener thoroughly in at least a quart of water before adding it. Fill 2 tubs with suitable amount of water – one for wash, the other for rinse. Add in the detergent in the wash tub & mix around until well dissolve. For heavily soiled garments, let them soak for 20-30 minutes. Start washing clothes one after the other by kneading the clothes in the water. Rinse in the other tub 2 to 3 times, ensure the detergent residues are gone. Add the appropriate amount of fabric softener to the water, mix well. Let the clothes soak for few minutes. Gently wring out the excess water by hand, then it is ready to hang dry. Detergent & Softener : How to use them?